Haihaisoft redesigned security architecture for DRM-X 4.0 with higher security standards. 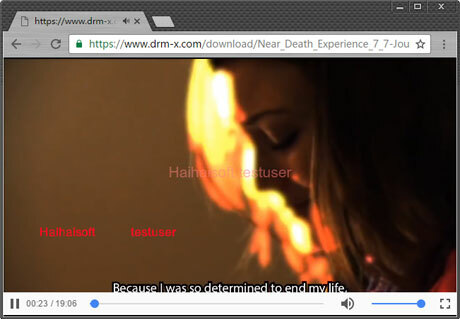 DRM Digital Rights Management Protect Content PDF, Protect MP4, Protect WebM, Protect MP3, Protect WAV, Protect html. Haihaisoft redesigned security architecture for DRM-X 4.0 with higher security standards. With new Xvast packager, encryption and data transfer are more complex and stricter than previous encryption. You can manage and control license Rights in details, and revoke DRM-X 4.0 sent licenses. DRM-X 4.0, user needs to install the Xvast browser to open the encrypted file. Xvast browser is based-on latest Chrome core. Chrome now is most people's favorite browser because it's the fastest browser, and with high security level. You can disable customers to download video, only allow online playback. 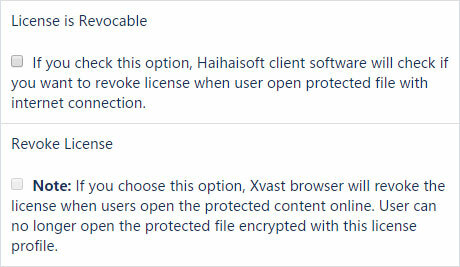 When users use the Xvast browser, they cannot use the Save as, Debug, View Source Code, and other features. The user can download the encrypted file only when you are actively providing URLs to users. 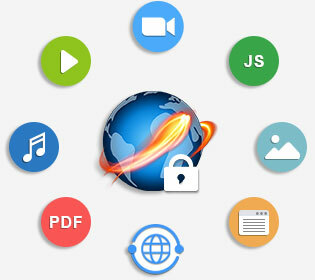 DRM-X 4.0 protects digital media files and documents with a license key to maintain content protection, even if these files are widely distributed. Each license is uniquely assigned to each computer or device. This prevents illegal distribution of digital media files and documents. 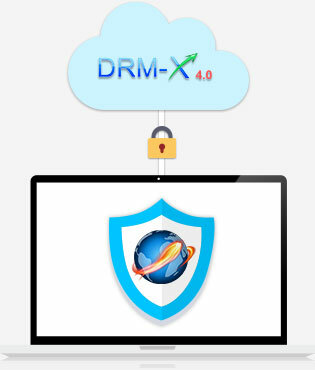 DRM-X 4.0 supports encrypted audio, video, movie and PDF e-books, web pages, pictures and other digital content, effectively preventing users from sharing, modifying and printing, and other illegal operations. Dynamic digital watermarking refers to the user's name or other user identification information such as name, mobile number, and ID number displayed on the content when the end user opens the DRM-X 4.0 encrypted file using the Xvast browser. Its dynamic digital watermark is irremovable and semi-transparent in content. Even user pirated content through the screen recording, you can still use legal means to obtain evidence and block piracy, effectively prevent end users from using external devices to illegally record content. 1. Two different watermarks are supported in the video. 2. The watermark is displayed at an oblique angle in the PDF document. 3. Multiple watermarks are displayed on the web page. 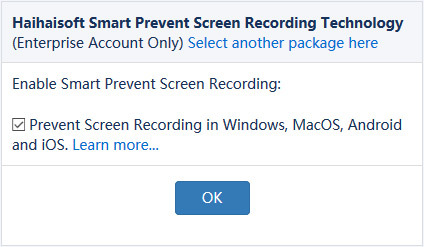 Haihaisoft Smart Prevent Screen Recording Technology is available for Windows, Android and Mac OS now. In the MacOS, it’s Whitelist Protection. It can ensure only Apple's system and commonly used software can be running. It completely eliminate the screen recording software. 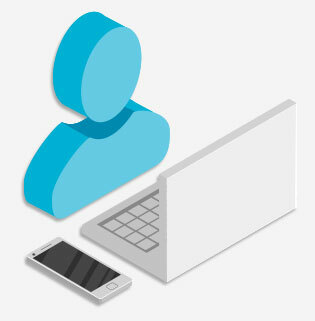 With the authentication combined with Hardware feature, you can restricts the end users can only acquire license in limited number of computer or mobile device. The specific device quantity can be set by content provider in the control panel of DRM-X 4.0. Turning on the hardware binding function can prevent user sharing username and password with other users, and effectively protect content security. To prevent users recording screens in virtual machine, DRM-X 4.0 supports disable VMWare and Microsoft Virtual PC. Once you disable virtual machine, user cannot open protected file in VMWare and Microsoft Virtual PC, it can effectively protect the security of encrypted files. 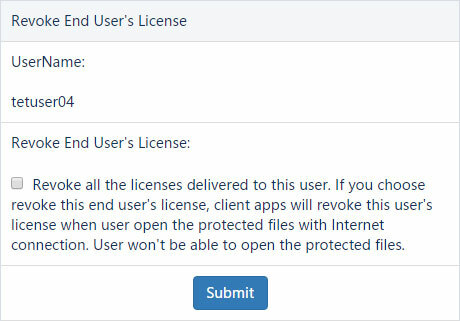 In DRM-X 4.0, the content provider can revoke the license for the entire license profile in the license profile edit. All encrypted files under this license profile will not be played after revocation. For example: you require all users to immediately stop opening the file that is encrypted by this license profile. Also, content providers can revoke licenses for users in the DRM-X control panel. For example: When a user purchases protected content and a refund occurs, you can revoke the license of the refunded user so that the end user cannot open the protected content. This guarantees fair trade and also guarantees your legal rights.